For those heavy hitters or really anyone who loves to hit first and think later, these gloves have got you covered. The gloves have a level of padding within them that takes a decent level of time to break-in; this translates into a thick material that can cushion any blow that is thrown using the gloves The padding just requires a decent length of time to compress fully, which results in a highly protected feel for the wearer; there is literally 2 inches of the stuff thrown into the glove to protect the wearer’s hand. The gloves also have the lacing on the wrist area which works to keep the glove on the wearer’s hand and allows for a high level of wrist support to be provided; the lacing is adjustable which implies that it won’t come off of the wearer’s hand anytime soon which is super important. 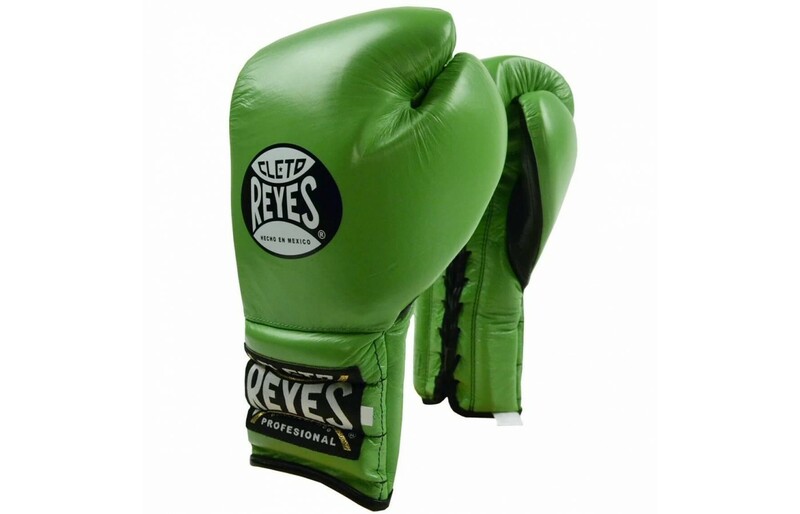 Cleto Reyes makes very high-quality boxing gloves. Their gloves are generally designed from a high-quality leather that never ceases to provide the wearer with what they need in terms of durability or protection; leather doesn’t rip very easily and that goes doubly so for the Cleto Reyes training glove. The stitching in this glove is also superb; it doesn’t loosen very easily and will continue to hold the high-quality leather material together for extremely long times. The lacing, like most lacing, is rather well-made and shouldn’t cause the wearer any worry as to whether they should worry about getting a replacement. The same thing goes for the inside of the glove and the padding that is included within it; it will not cause the wearer any level of stress because of the high-quality cushioning material that is used to make it. The design of the glove is one that provides the wearer everything that they need in terms of protection and cushioning while also having a certain level of style added to the mix. The Cleto Reyes training glove has a base color that varies depending on which one that wearer picks; this simply means that the glove has is just one base color with very little in variation throughout the design. The base color of the glove makes it very, very easy to mix and outfits to find just the right match of color so that the wearer doesn’t appear too gaudy. The gloves have the typical curves in the actual mitt with one slight variation; the thumb of the glove is a bit shorter than usual; this results in a feel that will be mentioned in later sections but long story short, it isn’t a bad one by any means. The glove has the classic Cleto Reyes insignia on the backhand to give it a sort of professional flair to the design; the same goes for the wrist of the glove and the knit patch that is featured there. 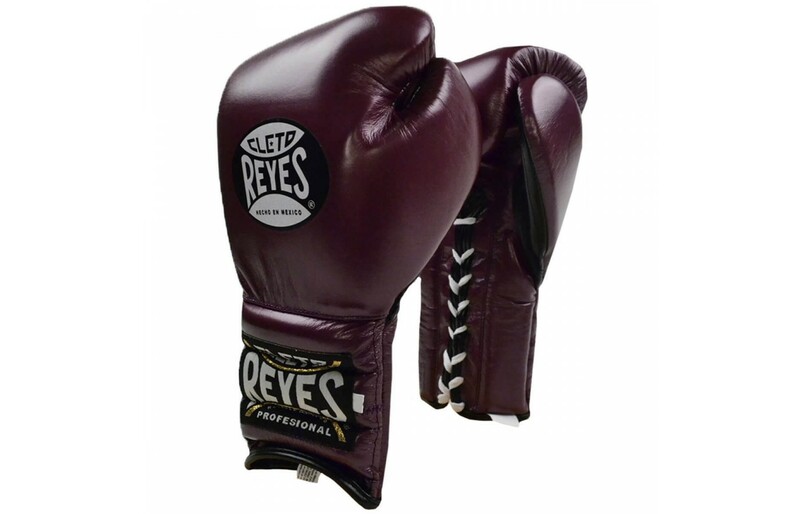 Cleto Reyes fitted these gloves with the casual lacing which is another feature that gives them the professional flair that they have. The actual neck of the glove is a bit extended, covering much more than the usual amount of the wrist that is covered by gloves; this is something that is important for wearers to keep in mind when making a choice about the gloves due to the fact that for some, the extended neck may end up being a bit uncomfortable. In terms of fit, the gloves do nothing short but deliver to the wearer. The lacing on the wrist of the glove gives the wearer what they need to have a comfortable and snug-fit while the glove is on hand; as mentioned earlier, this gives the glove a bit of wrist support so that the wearer doesn’t damage themselves while punching. To give the lacing feature on the glove a bit of backup, the glove also has a strapping feature which doubles the gloves ability to fit snugly on the wearer’s hands; the wrist support is much better than that provided by the average glove due to this feature. The thumb on the glove also gives it a tighter fit than normal which allows the glove to have the comfortable, snug fit that it is known for having, especially in that specific area. To aid these portions of the glove, Cleto Reyes fit it with ample padding; the padding allows the gloves to have a much tighter it than they would have without and works to ensure that they don’t come off while they are in use; the padding is also resistant to the effects of liquid on the inside which allows the gloves to provide the wearer with even more comfort while they are in use. The cushioning found in these gloves is a bit denser than the usual padding; this results in a decent number of days being required for the break-in time of the glove; this is something that should be considered for those who are seeking to potentially purchase these gloves simply because they won’t be very comfortable for a decent length of time. Once broken in though, the material on these gloves provide a high level of comfort to the wearer and does so even in the more strenuous activities like heavy bag work and sparring. For some, the elongated neck on the glove also works to provide the wearer what they need in terms of comfort, due to the extra area that they cover and support that is provided. Here’s the catcher with these gloves; they are on a much higher bracket in terms of the price that they are sold for. The price of the gloves is justified simply considering the longevity of the material; these gloves will last for years if taken care of correctly. At first, the comfort provided by the gloves isn’t much, simply because of the long break-in time that is required for them to really feel like much after the required break in time, the gloves begin to feel somewhat better and meld with the actual dollar amount that they go for. The entirety of the glove is very well made and will roll with the punches, so to speak. 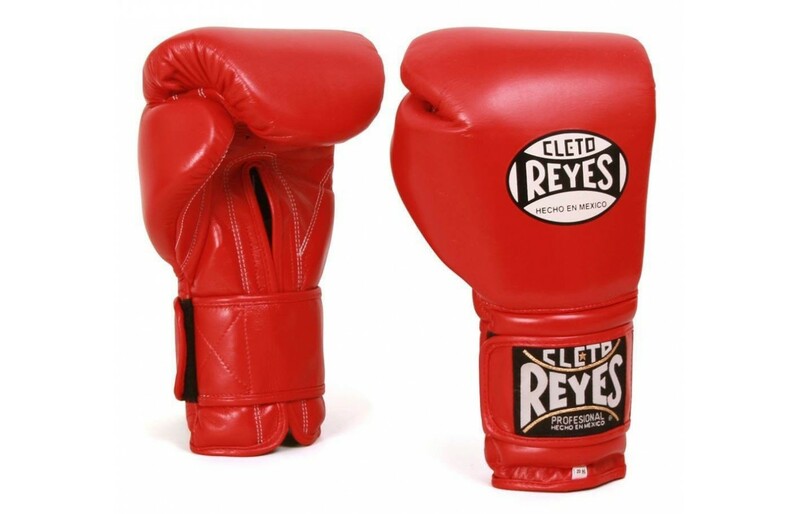 Cleto Reyes is known for making very high-quality boxing materials; having been around for about 70 years, the design of their gloves have had a rather long time to adapt and be improved upon; the name has withstood the tests of time and has done so with amazing finesse. They were founded in Mexico City and have been worn for various renowned boxing events. Aside from the gloves that are featured in this review, they also make rather high-quality bags, wraps etc. Their boxing materials are on par with several of the other leading brands in boing apparel and for a very good reason at that; their gloves work very well and will do so for years because of the functionality of the material itself. Their gloves are rather plain and can only be noticed by either the high quality or the insignia on both the wrist or backhand; the plain design of their gloves is what makes them stand out though because of the professional look that it provides to the wearer. The materials that are used in the design of their gloves is about standard, not! 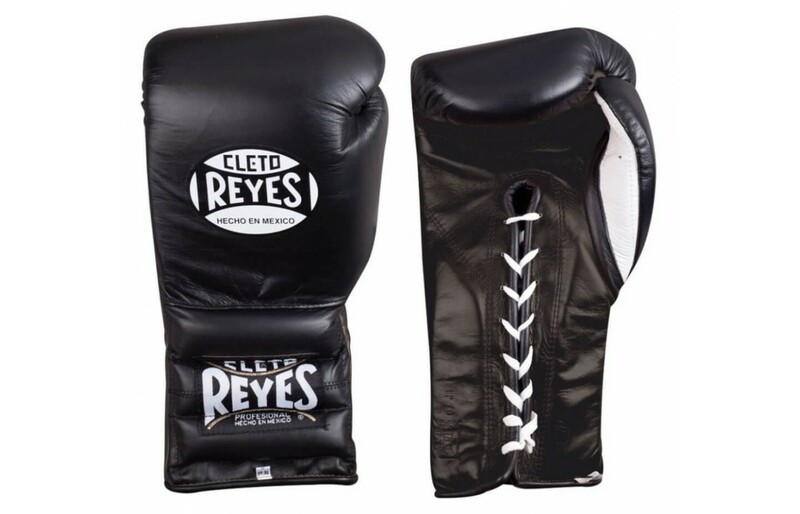 Cleto Reyes designs their gloves using a single grain leather for the body; the use of this material allows the gloves to function for the wearer and doesn’t open the wearer up to any of the harm that may come with the actual sport that the gloves are used for. Aside from this, the wrist of the gloves primarily the strapping comes with a few surprises; since tightening feature of the glove is designed with a dual feature, the glove has 2 distinct materials being used for this portion of the glove. The lacing on the glove is of the standard material while the secondary tightening feature, the strap, is designed from a Velcro material; the use of the materials allows the glove to provide the wearer with a snug overall fit. The stitching is designed from a nylon material as is the case with the majority of boxing gloves and is rather durable. The materials used throughout the design of this glove provides the wearer with a very high level of comfort and ensures that one doesn’t have a glove that breaks down after a few rounds on the heavy bag or in the ring. The leather material used in the majority of the glove’s design allows for a high level of durability and is the main reason why the gloves don’t break down very easily when used for extended periods of time; this is pretty standard for boxing gloves. The nylon stitching in the glove is the main reason why these gloves work so well for their wearer’s though; the gloves are stitched so tightly and discreetly that it is just rather hard for them to come apart with use. Overall, the design of the gloves is why they give the wearer years upon years of available usage; they just don’t break down. These are essentially boxing gloves; they have the ample levels of cushioning required for them to function at the level of a boxing glove and provide the wearer with all that they need in terms of protection and support. Something to note about the design of these gloves is the cut of the glove could also provide the wearer with a bit of support when used for other sports such as Muay Thai; the only thing is that the neck of the glove is a bit elongated and may make the liquid movements required for use in Muay Thai to be a bit awkward. The fact that boxing is a 2 point of contact sport makes these gloves perfect, simply because of the high level of cushioning and the shock absorption provided by the cushioning in the gloves. Cleto Reyes, much like other boxing glove manufactures makes their gloves in the base weight classes such as 8oz all the way up to 18oz. The individual weight classes provided by the glove have all of their corresponding cushioning and provide the wearer with a high level of comfort while the gloves are in use. All in all, Cleto Reyes boxing gloves are of amazing quality; the materials used throughout the glove’s design allows the glove to be used for extremely long periods of time and ensure that one doesn’t deal with either continuous repair or replacement of them; this is something to keep in mind because of the costs that are associated with either one of the activities. The padding in the glove may take a bit of time to be broken in but this is a rather small issue when paired alongside the functionality that the glove provides to the wearer while in use; the break in time is rather long (6 mos). Aside from this everything else about the glove is on the literal up and up; the lacing provides the wearer with a high level of wrist support and also ensures that the glove attaches to the wearer’s hands unless otherwise needed.